We are hosting a HackerLab event in coordination with the Northeast Arc User Group fall conference (NEARC). This is a four-hour, hands-on, strategically guided lab for developers that will cover how to build map apps with ArcGIS Online, APIs and Services, Open Source, and also with AppStudio for ArcGIS (for native apps). If you're lucky, you may even get to test-drive AppStudio to build native apps with QML. You will be given time to play in between the tutorials. This is a BYOM, BYOI, BYOA, and BYOD event: bring your own machine (seriously, we don't have any extras), ideas, apps and data. Yeah. ABSTRACT: With the more intuitive interface of AGO, it is easier to incorporate AGO activities in undergraduate non-GIS courses, enabling students to focus on content rather than mastering the technology. With this in mind, three professors from different disciplinary backgrounds, cultural geography, geosciences, and science education, created a 3-week module on food security using AGO to integrate social and environmental datasets. The module culminates with a small research project on food security in three localities, urban New York City, rural Nebraska, and developing islands in the Caribbean. ABSTRACT: ArcGIS Online is generating a sea change in the educational use of Geographic Information Systems. Using AGO and nothing more than a browser, today’s educators and students can create maps combining their own data with infinite “open data” resources available in the cloud. With AGO they can analyze data and easily share the results of that analysis in a variety of formats. In this session you’ll see how easy it is to execute basic GIS tasks (symbolize, filter, select) in this robust online version of the software. ABSTRACT: The American Community Survey (ACS) is an ongoing survey that generates estimates on social, economic, housing, and demographic topics. Data users can access these estimates down to neighborhood level (tract and block group) using the American FactFinder. This presentation will cover background information about the ACS, an explanation of the ACS datasets and topics, and a demonstration of accessing data using American FactFinder. ABSTRACT: The opioid epidemic presents a major public health challenge and contributes to a larger syndemic, which includes non-prescription opioid misuse, heroin injection, opioid overdoses, and hepatitis C virus (HCV) and HIV clusters. Over the past decade, Massachusetts has experienced increases in all opioid-related morbidities and mortalities., As this syndemic continues to grow, it may be a harbinger of future increases in HIV and HIV-HCV co-infection rates. Through the use of various GIS and spatial epidemiological methods, we identified spatial hotspot clusters (p < 0.05) on the neighborhood, census tract, municipality, and state levels. We identified locations where injection drug use, overdose, HCV and HIV clusters were a concern, and where enhanced prevention, treatment, and care can help combat the opioid epidemic in Massachusetts. ABSTRACT: GeoInquiries are designed to be fast and easy-to-use instructional resources that incorporate advanced web mapping technology. Each 15-minute activity in a collection is intended to be presented by the instructor from a single computer/projector classroom arrangement. No installation, fees, or logins are necessary to use these materials and software. This session will explore GeoInquiries designed for the AP Human Geography classroom. GIS Educators Day Session. Students as Researchers: How Does Watershed Land Use and Biodiversity Effect Water Quality? ABSTRACT: Essex Technical High School is a new merger of both traditional vocational education and agricultural education. In the environmental technology vocational major, we use our own 40 acre site as well as the surrounding parks and rocky shorelines to research topics ranging from water quality to climate change. Mapping with GIS is a core competency or skill for us, and a component in each year of our four years in high school. Our presentation today outlines our junior year GIS project which utilized the GIS data layers in MassGIS (watersheds, hydrology, land use, and biodiversity ) to define two very different watersheds As students, we enjoy learning with the combination of hands-on research, lab analyses, and GIS mapping to answer real questions concerning our local environments. ABSTRACT: Esri’s Web Apps Templates offer a quick and powerful way to control and enhance the experience of the people who view your online map. In this hands-on BYOD session come explore and compare a variety of different configurable Web Apps. At last count, there were 27 different templates to choose from. In our time together, we will build at least 4 different types, and if time enables… even a “Time Enabled” Web App! ABSTRACT: Students in the Environmental Technology program at Worcester Technical High School expressed frustration about beautiful trees that had been removed due to the United States Department of Agriculture’s(USDA) Asian Long Horned Beetle’s (ALB) Invasive Species Eradication Program. Students partnered with the USDA and learned to identify trees impacted by the ALB. When students learned of a new infestation in the city, they developed an online application using GIS to identify and plot impacted trees in the vicinity of the infested “mother” tree. Acting as environmental managers, they applied their new knowledge to recommend future tree plantings that would increase the biodiversity and resilience of the urban forest, reduce stormwater runoff, and reduce greenhouse gases in the urban environment. They presented their recommendations to the USDA. For over a century, maps have been a key part of many starting point for discussions, a way to share local knowledge, and have provided spatial information to inform decisions on a range of issues. Online mapping offers the promise of a spatially relevant, interactive method for connecting to and with outreach audiences in ways not possible a few short years ago. The patterns and potential of online mapping for Cooperative Extension are equally relevant for organizations of all types hoping to conduct effective outreach and engagement. While many organizations engaging in outreach are currently using online mapping effectively in their work, a far greater number are either not using it at all, or not using it to its fullest potential. In order to promote the use online mapping in Cooperative Extension and other organizations involved in outreach and engagement, the eXtension geospatial technologies Community of Practice (Map@Syst) has created a new website http://exgeospatial.org. While still linked to the parent http://extension.org and its capabilities (such as Learn for webinars, Ask an Expert for direct support), the new Map@Syst website provides an opportunity to both inspire people with examples of how online maps can be used for outreach and engagement, and provide support for those who need help learning how to make and share maps online. This presentation will outline how GIS users can use the Map@Syst website to help their own colleagues, clients and/or students better understand how mapping may be used for outreach and engagement, while providing an opportunity for those same users to describe and share their own examples of outreach with online mapping. In the summer of 2015, Scott Semmens accompanied students from Hopkinton and Bow High Schools (NH), to South Africa to study the geography, ecology, culture of the Greater Kruger National Park area. Their field study included observing animal behavior, tracks, and sign as well as interacting with local villagers. Over the 21 days of their adventure, they trailed elephants, rhinos, and lions and showed local students how to use ArcGIS to better understand their community and its surroundings. Scott is originally from North Dakota, and currently resides in Stoddard, New Hampshire. Scott has degrees in Biology, Anthropology, and Science Education. He has been teaching High School science for over 25 years, including biology, chemistry, earth science, ecology, astronomy, marine biology, GIS, physical science, and adventure education. Scott has been a tracker for over 20 years. View the full agenda for GIS Educators Day below. Led by Bill Guazzo. Come enjoy glimpses of Falmouth’s varied ecosystems as you bike past marshes, cranberry bogs, beaches, and woodlands. A brief street ride leads to the path for 8.5 miles of flat, easy biking into Woods Hole. Bikes may be rented from the hotel for $20. Check out our Story Map (http://arcg.is/1NBGKoM) to preview a short stretch of your ride! Optional but space is limited; RSVP on registration form. Transportation to and from activity is on your own. The Falmouth Museums on the Green contain a treasure trove of stories and artifacts that tell the story of the town of Falmouth, Massachusetts. The museums overlook the Village Green where members of the Colonial militia practiced in the 1700s and sea captains built their homes. Two 18th-century houses display period furniture, fine art, textiles and rotating exhibits that provide a glimpse into the town’s rich historic past. $5 fee. Sheltering Quissett Harbor and reaching into Buzzards Bay, The Knob (http://www.qhpt.org/quissett_maps.htm) is a spectacular spot to experience the Cape coast. Come join your guide for an easy walk along the wooded path and shore to see this secluded piece of Falmouth. 8 miles from Hotel. (Carpool to parking encouraged; approximately a 20-minute drive from hotel). Data in tables can be informative… but using geospatial analysis unleashes the “Power of Data”. In this short presentation we will showcase three powerful approaches using the ArcGIS online mapping platform. ABSTRACT: You and your students have started to use ArcGIS Online and maybe you need more strategies to bring local, national and world data into ArcGIS Online. This workshop will give you direction on the types of data that ArcGIS will display, and how to import and edit the data. We will practice bringing data into ArcGIS Online via Mapnotes, CSV, shapefiles, GPS/GPX and Geoforms. ABSTRACT: Survey123 is a form-based data collection tool that combines the power of smart forms and geography! This robust mobile app has been used for intelligent information gathering on the spread of Ebola in West Africa and for recovery operations after the series of devastating Nepal earthquakes in 2015. With Survey 123 you can design surveys that speed the data collection process with predefined questions that use logic and provide easy-to-fill answers. Because data captured in Survey123 is immediately available to the ArcGIS Platform, you can create maps to visualize, analyze and share your field work. This hands-on workshop will provide a workflow for designing and implementing surveys in the field and analyzing survey results in ArcGIS Online. ABSTRACT: Open educational resources (OER) are free to use, modify and recombine with other content. This session will (1) identify some of the places to find OER related to GIS and geography, (2) share tips to evaluate the offerings, and (3) consider how to best use them. We’ll also talk about the pros and cons of sharing attendees’ teaching and learning content as open educational resources. ABSTRACT: Climate change, sea level rise, and increasing power of storms are vague concepts for any teenager until they apply the science to their own home towns. Our workshop focus on both the research behind our changing climate and the risks, students' own communities may face due to rising seas and storm surges. You will create a community vulnerability assessment using coastal elevation data, the U.S. Geological Survey (USGS) Vulnerability Analysis and MassGIS data layers of populations, critical infrastructure, emergency management, schools, roads, etc. Worst case scenarios for hurricane storm surges may also be added to your community vulnerability assessment. A detailed work flow will be provided to assist you and your students in the GIS components, and to insure a professional presentation to your home community. ABSTRACT: Historical maps are snapshots of the nation’s physical and cultural features at a specific time. Maps of a particular area can show how the area looked before development and provide a detailed view of changes over time. In this hands-on workshop, you will use the USGS Historical Topographic Map Explorer App to locate historic USGS topographic maps of one location and then add those maps to ArcGIS Online to create a historic portrait of that location. ABSTRACT: Where and what type of assistance is needed after a natural disaster? How do patterns of crime vary in different parts of the city and at different times of day? Spatial analysis is the most intriguing and remarkable aspect of GIS. Using spatial analysis, you can combine information from many independent sources and derive new sets of information (results) by applying sophisticated analysis tools. This hands-on session will provide practice with a variety of spatial analysis tools and scenarios. ABSTRACT: The winter sport industry is an important part of the New England economy as well as an integral component of the New England psyche. The impacts of climate change have caused great uncertainty in the industry and will require economic and technologic innovations to deal with the fluctuations in the length of the winter season, temperature variation and snow pack fluctuation. The Earth Science program at Worcester State has entered into a cooperative monitoring and assessment program with Wachusett Mountain ski resort and the Mass Department of Environmental Conservation. Continuous monitoring weather stations and soil probes will be installed on Mount Wachusett and vegetation and small mammal surveys will be conducted to examine the environmental and physical changes that have occurred and will occur. A century old bar in the charming village of Woods Hole with spectacular views. Additional fee of $50 and advance registration required. Fee will include a delicious dinner portion of Cape Cod Fish & Chips, one drink ticket, transportation and fun bar games! Come catch up with old friends and make some new ones at this laid back social gathering. Transportation provided as follows: If you plan to take advantage of the shuttle transportation to Captain Kidd, the bus will depart from the hotel main lobby promptly at 6:15 PM. The return trip back to the hotel will depart the restaurant at 8:30 PM and again at 9:30 PM. For reference, the restaurant is approximately a 30-minute drive from the hotel. Allen Carroll is Program Manager for Storytelling at Esri. He leads Esri’s Story Maps team, which develops open-source web apps that enable thousands of people to tell place-based stories combining interactive maps and multimedia content. The team also develops its own story maps in order to prototype new user experiences and to demonstrate best practices for map-enabled storytelling. The team’s website is at storymaps.arcgis.com. Allen came to Esri after 27 years at the National Geographic Society. As chief cartographer at NGS, he was deeply involved in the creation of the Society’s renowned reference and wall maps, globes, and atlases. He led the creation of the Seventh and Eighth editions of the World Atlas, incorporating satellite imagery and innovative thematic maps into the editions and integrating them for the first time with interactive Web resources. He spearheaded the publication of many new maps and Web resources, ranging from decorative wall maps and supplement maps for National Geographic magazine to special projects featuring biodiversity, conservation, and indigenous cultures. He is a former member of the National Geospatial Advisory Committee. ABSTRACT: Esri now offers new Vector Tile Layers! With these vector basemaps, you are able to turn on and off layers, change symbology, and even update boundaries and label. The session will provide an overview of vector tile mapping, demonstrate how to create vector tiles using ArcGIS Pro and how you can change your map through vector tiling styling. ABSTRACT: Beginning in 2016, the Delaware River and Bay Authority sought to assess the feasibility of using drone technology to compliment the bridge inspection process. WSP | Parsons Brinckerhoff was already contracted to complete the traditional bridge inspection for the Delaware Memorial Bridges and was a working partner with Keystone Aerial Surveys through their Geospatial group. As a cross-disciplinary team, we developed a workflow that combined Keystone’s UAV expertise and WSP | Parsons Brinckerhoff’s Geospatial capabilities to provide a user friendly way for bridge inspectors to view imagery captured from a DJI Inspire Pro quadcopter in ESRI’s Drone2Map application. This presentation will cover UAV logistics and permitting, the image acquisition process and importation into Drone2Map. ABSTRACT: This presentation will discuss variety of UAVs and sensors as well as basics of site planning for data collection and access. Once collected the ability to share imagery by compressing it at a variety of ratios for ease will be addressed. This presentation will briefly review these concerns leaving time at the end for discussion and questions. ABSTRACT: Pace University requires each student to complete a service learning course. Over the years, GIS has served as such a course, sending students into communities and organizations to determine how GIS can help provide information and maps for making decisions. Along the way, students learn the complexity and difficulty in dealing with volunteer or community organizations and in getting accurate or useful information. Several class projects will be used as examples. Projects that were undertaken and abandoned will be reviewed, with possible reasons why they could not be completed by an undergraduate class. ABSTRACT: The GIS Team at the City of Boston has been involved in a number of mobile data collection projects over the years. The process has evolved from using the City's 311 case management software to create points, and Runkeeper to track the progress of data collection to most recently using Esri's Collector applications to manage the collection of several city assets such as wifi hotspots, speed limit signs and parking facility information. The data has been made available to City Departments using BostonMaps, the City's branded version of AGOL. ABSTRACT: Estimating the non-market value of beaches for saltwater recreation is complex. An individual’s preference for a beach depends on beach characteristics and perception. When choosing one beach over another, an individual balances these personal preferences with any additional costs, in travel time and/or fees to access the beach. This trade-off can be used to infer how people value different beach characteristics and evaluate changes in beach characteristics, such as water quality. Especially when beaches are free to the public, beach value estimates rely heavily on accurate travel times.Our goal is to evaluate the benefits of different levels of water quality improvements to saltwater recreation on Cape Cod. Observed visitation data and beach characteristics will be used to construct a model for how much people prefer different beach characteristics, including water quality and travel time. On Cape Cod, saltwater beach recreation participants include both local residents and those making seasonal day trips from other parts of the region, making the scale of analysis large and transportation congestion significant. We will describe several of the transportation networks and route services available and compare a few based on their ability to meet our specific requirements of scale and seasonal travel time accuracy. ABSTRACT: The 1,700 acre Sebago Lake Land Reserve is a managed forest intended to protect Sebago Lake, the water source for 200,000 people in greater Portland. The Reserve, which is open to the public, features over 13 miles of trails and kiosks at 12 points of entry. The majority of these are found at one central 500 acre parcel, but several other smaller parcels and trail systems exist, making the upkeep of paper-based maps a challenge. Our staff envisioned a system whereby visitors could scan a QR code on their mobile device at any kiosk to see a map depicting their location. We wanted a solution that was low cost, easy to distribute, GPS-enabled, and with the ability to overlay our own data. We looked at a couple of options and settled on CarryMap, an ArcMap add-in that produces an offline iOS or Android map from a working ArcMap document. We will share the pros and cons we found in various solutions, as well as lessons learned in the process of producing the mobile map and distributing it to the public. ABSTRACT: Making visually beautiful and meaningful maps should be within everyone's reach - and Esri's Smart Mapping capability does just that. New mapping and cartography workflows in ArcGIS Online automatically analyze your data and suggest the best way to represent it, taking some of the guesswork out of setting up your map. Additionally, new rendering capabilities and styles allow you to go beyond the basics and design maps that bring your data to life. ABSTRACT: The University of Connecticut’s Center for Land Use Education and Research (CLEAR) has a long history of making applied research results usable and accessible to audiences covering a wide range of technical ability. CLEAR has successfully translated science-based complicated information into multi-media experiences with story maps. The ability to organize and combine data, maps, information, text and graphics is powerful and effective. The presentation will be a tour of several CLEAR story maps with a focus on the way information is conveyed as well as techniques for doing so in a story map. ABSTRACT: Commencement at UMass Lowell is a huge event encompassing many different departments. In previous years, it was coordinated on paper with different versions of the same data compiled into one large manual. ArcGIS Online offered solutions regarding data collection, coordination, and sharing. It also was a great conduit for “non GIS” users to access, edit, and share spatial data about the university. While using ArcGIS Online was supposed to be a pilot project for Commencement, we ended up utilizing the Apps we created to efficiently coordinate departments and standardize their data. Public and internal apps were created and used before and during the event. These apps also provided a more portable means of transporting and accessing the data. While there were cases of trial and error, we were able to provide Campus Police, Emergency Services, Parking and Transportation, and the Events Departments with data that was useful and necessary to all involved. The more people see what we can do, collect, and share, the more requests have been coming in for data collection, apps and online maps. It is great to see people get excited about data collection and being able to help a growing number of departments around campus. Learn tips and tricks on conducting safe and effective UAS operations in support of GIS-based mapping. ABSTRACT: Merrimack Valley Planning Commission (MVPC) is a regional planning agency that provides professional planning services to Northeastern Massachusetts. Established as a public, nonprofit organization, MVPC is chartered to promote the orderly development of the 15 cities and towns of the region. During the historic winter of 2014/2015, nearly 10 feet of snow fell in the region which resulted in a catastrophic failure of Newburyport’s vacuum sewer system on Plum Island. To address this problem, MVPC collaborated with Newburyport's Department of Public Services to map the sewer system and created a mobile GIS application to manage each of the system components. Using this application in conjunction with an online viewer, City officials are able to record functional information about the sewer system and alert the public as to its status 24/7. Troubled locations are symbolized with a red line and when the system is restored, the lines revert back to green. The application allows the City to better respond to operational glitches and expedite the process in locating any mechanical failures and the online viewer keeps the residents informed. ABSTRACT: The Northeast Ocean Data Portal is an online data and information system developed by a consortium of private, nonprofit, and governmental organizations to support ocean planning in New England. The portal provides access to Cloud-based data products and interactive web maps that characterize marine resources and the use of ocean space, while also harnessing and providing access to a range of ocean management and planning resources within and outside of the region. Recently, the Portal has undergone a number of updates to habitat, marine life, economic, and national security data, in conjunction with the draft Northeast Ocean Plan, and has undergone a public comment period. This presentation will discuss the latest additions to the Portal and the culmination of this collaborative 5 year regional ocean planning effort. ABSTRACT: Everyone has a story to tell. Or, more likely, you have many stories to tell! Esri Story Maps have been a hugely popular way to put maps, images, videos and other media into an interactive web application that brings attention to a particular topic. But, like other GIS projects, the management of the content and story maps that you create can be a challenge. That's where My Stories comes in. With error checks, sharing tools and more, My Stories is a one-stop place to view, manage and create your story maps. ABSTRACT: The collection of data in the field, both spatial and attribute, has come a long way from pen and paper. Today’s state of the art data collection software enables an easier, more streamlined process, allowing it to be applied in more field situations than ever before. This presentation will take look at the use of Collector and ArcGIS Online/ArcGIS Server and its application on several distinctly different projects and uses to demonstrate its versatility in field. These projects span from the typical catch basin cleaning, to manhole and ditch inspections, to pipeline construction pipe tally/materials tracking. The visualization of the data collected using Operations Dashboards and Business Intelligence Tools will also be revealed for a couple of the projects. Another piece of the puzzle, the GPS/positional options, will be examined based on the varying requirements of each project. The lessons learned, including on the hardware used, will be shared in the hopes that both people thinking about getting started or those implementing similar solutions can take away something valuable. ABSTRACT: Map@Syst website provides an opportunity to both inspire people with examples of how online maps can be used for outreach and engagement, and provide support for those who need help learning how to make and share maps online. ABSTRACT: The NHD Stewardship process in Maine is active and ongoing. The standard editing process prioritizes coastal and urbanized areas where many anthropogenic changes to hydrology have occurred. These changes include development-related modifications such as channelization and diversion of waterways, construction of retention basins and reservoirs, and dam construction and removal. Additional feature edits are driven by the need to correct errors (e.g. missing and mislocated streams) observed during field data collection and monitoring efforts. Layers and methods used to update and correct NHD features include high resolution LiDAR elevation data, high resolution imagery (NAIP, Google Earth), Esri ArcGIS Hydrology Tools, and the TauDEM (Terrain Analysis Using Digital Elevation Models) hydrology tools. In addition to the standard editing process, a special project was undertaken to add and update statewide estuary features. Refining estuarine waters in the NHD was particularly important because state regulations such as Shoreland Zoning are based on the location and status of such waters. More accurate delineations increase the likelihood that such rules fulfill their purpose, without imposing undue burdens on property owners. The location and extent of estuary features was determined based on the best available state-wide salinity, head-of-tide, and habitat datasets. ABSTRACT: Up-to-date imagery, high-resolution terrain models, precision base maps - this presentation will highlight the many ways in which Unmanned Aerial Systems (UAS) can supercharge your GIS with better, more accurate, and current data. Drawing from a broad range of natural resources, transportation, and urban planning case studies, we will show how UAS platforms provide near-immediate, GIS-ready products for mapping and analysis, and we will also discuss the field and data-processing workflows needed to capture high-quality, actionable information. AUTHORS: Steven Sadlowski, Town of Winchester; Randy Trott, Timmons Group. ABSTRACT: This presentation will examine the track of a wastewater planning scenario through the Cape Cod Commission’s wastewater planning process. Scenarios are developed and analyzed through a series of web applications that are backed up by a centralized SQL database and feed a developing API. All scenarios are geospatially created in our web mapping application, watershedMVP, and these scenarios are stored and shared to other applications including SAM, the Scenario Assessment Model, and FIM, the Financial Impact Tool. The presentation will briefly touch on leveraging transparent GIS data, communicating complicated wastewater concepts simply and a tour of some custom applications developed by the Cape Cod Commission. Attendee Lunch & Visit with Vendors - Sponsored by Topaz Engineering Supply, Inc.
ABSTRACT: ArcGIS Pro is the premier professional desktop GIS application from Esri. With ArcGIS Pro, you can visualize, edit, and analyze your geographic data in both 2D and 3D. After you create projects, maps, layers, tools, and more, ArcGIS Pro has several options for sharing your work with others. ArcGIS Pro is a 64-bit application, using a faster graphics library, and a ribbon-based toolbar, it provides a framework for the next generation of ArcGIS for Desktop. ABSTRACT: Esri is offering more and more applications to leverage your GIS data and ArcGIS Server or ArcGIS Online infrastructure. Using a free application seems like a good starting point to deliver interactive access to GIS data on the City of Worcester website. The Election Polling Places application, one of the ArcGIS for Local Government solutions, would take advantage of existing, well-maintained data. Plus, it is a timely need during this presidential election cycle. With the help of a capable intern, the app is configured and ready to go. So why didn’t it launch? What did I learn in the process? Would I work with another Local Government solution in the future? Join me for an overview of the project and answers to these questions. AUTHORS: Michael Funaro, Latitude Geographics Group Ltd.
ABSTRACT: With recent advancements in technology, opportunities for communicating with the public have grown exponentially to include social media, mixed media, and many other forms of content… including maps and mapping applications. These expansions in technology hold the promise of increased participation for all, but present challenges for the full inclusion of persons with disabilities. Mapping applications have escaped the use of web accessibility guidelines for years under the pretense that it is just too difficult to do. Not anymore! We will explore the World Wide Web Consortium (W3C) recommendations for Web Content Accessibility Guidelines (WCAG 2.0) as well as Federal Guidelines and show you how we’ve built our apps to be compliant. With the rest of the Internet meeting stringent guidelines for accessibility, your apps should be no different. Be legally compliant and impress your cities and towns, employees and the public with incredibly powerful tools for people with disabilities - with the click of a button. ABSTRACT: The story map journal provides the ideal platform to combine project processes and final results in a useable and useful format for the public. In this presentation, we will discuss how we customized the story map journal to publicize and summarize a unique and critical coastal resilience project in Connecticut. Topics include using Bootstrap to implement grids, clever ways to use images in the ‘Swipe’ app, as well as ways to work across organizations to collaborate on an application. We will also discuss how all levels of government, as well as other institutions, came together to establish a Regional Framework for Coastal Resilience in Southern Connecticut. The project was driven by two COG's - South Central Regional Council of Governments (SCRCOG) and Connecticut Metropolitan Council of Governments (METROCOG) in partnership with The Nature Conservancy and ten municipalities alongside supporting NGOs, state and federal agencies, academic institutions, youth engagement organizations, businesses, and civic groups. The main objective of this project was to comprehensively assess, prioritize and advance resilience opportunities to simultaneously reduce risk at local and regional scale. Key successes included the integration of natural/green infrastructure concepts, principles, and priority projects into core hazard mitigation, comprehensive planning and capital expenditure efforts. ABSTRACT: MassDOT's GIS Services has been working to expand service and functionality of GeoDOT and GeoDOT for MPOs, the Massachusetts Department of Transportation official ArcGIS Online enterprise portals for GIS data sharing in the Commonwealth. GeoDOT has been identified as a successful tool to enhance GIS collaboration within and between state agencies and other stakeholders, and GeoDOT for MPOs has increased the quality of expert data creation by knowledgeable regional entities. Using these new technologies, the MassDOT Road Inventory has moved from traditional maintenance through interpretation of physical documents, to a versioned, dynamic, web-based platform. MassDOT hopes that in sharing this information with a wider professional group, we will be able to foster interest in relevant parties, and create better, more accurate state transportation spatial products. ABSTRACT: The Parcel Fabric is a continuous surface of connected parcels capable of managing control points, COGO dimensions, and their linked boundaries stored in a GIS. The Connecticut Department of Energy and Environmental Protection (CT DEEP), in the fulfillment of Public Act No. 14-169, is using the Parcel Fabric to establish a public use and benefit land registry capable of providing deeds, easements, land surveys, maps, location, ownership, and management plans for each parcel owned by CT DEEP, other state agencies, and land conservation organizations. This talk will cover the technical challenges, steps of implementation, established benefits of using the fabric, and the future of CT DEEP’s Public Use & Benefits Land Registry. ABSTRACT: Rapid advancements in drone technology enable us to collect accurate and timely data for nearly limitless commercial applications in the engineering and consulting industry. New rules, which took effect in late August, provide the necessary framework to safely integrate this technology into the national airspace. Until now commercial use has been authorized on a case-by-case basis under a Section 333 Exemption. This program will examine the regulatory requirements of Part 107 and Section 333, and discuss innovative applications of UAS technology in the geospatial industry. ABSTRACT: ArcGIS Pro is seamlessly integrated with ArcGIS Online. See how it can be used to publish web maps, and feature layers as 2D services, or web scenes, and scene layers as 3D services. Attend this technical session to see how easy it is to publish content from ArcGIS Pro. ABSTRACT: MassGIS has been using ArcGIS online (AGOL) extensively to support web mapping application, development, and ideas. Using the cloud, MassGIS is able to deliver datalayers and orthoimagery tile caches as web services to its users. Now, users do not need to have their own copy of the data; rather, they can simply add it to their map project as a MassGIS provided map service. In addition to providing an important platform to deliver data, maps and online applications to the public, AGOL has served as a primary tool to respond to the many requests from state agencies asking to depict a specific story through a simple interactive web map. This presentation will provide an overview of MassGIS' work with AGOL; it will also detail how MassGIS creates and publishes tile caches for orthoimagery, parcels and base maps, and leverages its own ArcGIS Server implementation in conjunction with the cloud. AUTHORS: Matt von Wahlde, Geonetics, Inc.
ABSTRACT: Mobile GIS and ADA ComplianceGIS and mobile technologies play an important role in the collection, analysis, and remediation of assets governed by the Americans with Disabilities Act (ADA). Field inventory and auditing of assets such as facilities and public transportation infrastructure are a natural fit for mapping tools. Determining accurate locations of assets such as bus stops, curb ramps, signs and signals, and features internal to buildings is especially important first step in a developing a comprehensive GIS-driven data management system. GIS analysis using social factors and other location-based data is critical in assessing issues such as path of travel and developing location based prioritization metrics. This presentation will focus on real-world application of GIS and related data management technologies relevant to ADA assessment. This product-neutral presentation will discuss technologies and approaches from a lessons-learned perspective. It is intended to help accessibility stakeholders make informed geospatial data management decisions when for their data management initiatives. ABSTRACT: Advances in Technology now provide the ability of interfacing Document Management Systems with GIS. In the past these documents had to be linked to the corresponding geographic feature by way of a property identifier. For that reason, the integration of County Clerk/Register documents was particularly difficult to integrate with GIS. With the increasing capabilities of Optical Character Recognition and Web Browser-based technology, it is now possible to integrate land records, such as deeds and mortgages with GIS technology. This talk will illustrate these concepts through live demonstrations and actual case studies. An amazing demonstration of powerful technology solutions, including OCR, internet search engines, and live integration of multiple systems. ABSTRACT: In 2014, The Nature Conservancy’s Connecticut Coastal Resilience team successfully secured a large “Sandy” grant to advance a “never before tried” approach for resilience in Connecticut. This team has been advancing a community resilience building project with two core partners – Connecticut Metropolitan Council of Governments and the South Central Regional Council of Governments. Development of a geospatial database, containing 326 green/natural infrastructure projects, identified through field reconnaissance along Connecticut’s coast and associated watersheds, was a central task for the partnership. This “Southern Connecticut Regional Framework for Coastal Resilience” project was funded through the Hurricane Sandy Coastal Resiliency Competitive Grants Program as part of the Department of Interior Sandy Grant. Overall, this project will help to advance "smart" investments in proactive risk assessment, community engagement, and green infrastructure projects. This will help reduce the consequences of large-scale storms and sea level rise, while strengthening the resilience of existing and future natural ecosystems. The project area includes 10 municipalities from Fairfield to Madison, encompassing the two largest population centers in Connecticut (Bridgeport and New Haven). As part of the overall project, the geospatial database has been converted into an interactive web application called the “Regional Resilience Projects App”. ABSTRACT: Learn how to use Tasks in ArcGIS Pro to chain together steps into a packaged workflow. They can then be used as a tool to maintain a standard workflow, streamline common sets of activities, or help a user new to learn a new pattern. ABSTRACT: Being resilient requires taking a look back at past damages from hazard events and reviewing models of future climate scenarios. Individuals, governments, institutions and businesses can only change if they have a clear path forward. In this session, the speaker will describe collaborative approaches being used to increase Cape Cod’s resilience to severe storms and climate change impacts. Collaborative efforts involving multiple partners include hazard mitigation planning, vulnerability assessments of transportation assets using an online Sea Level Rise Viewer, and a 3-year grant from the National Oceanic and Atmospheric Administration (NOAA) to build GIS-based resiliency strategies for municipal officials and the general public. Mapping tools developed by the Cape Cod Commission are used to translate technical data into understandable and actionable language, estimate loss of individual and government assets, communicate adaptation strategies, assess people’s willingness to pay, communicate the need for action, and engage the public in selecting and implementing site-specific strategies. AUTHORS: Daniel J. Boudreau, Jr, GISP, GZA GeoEnvironmental, Inc.
ABSTRACT: In 2016 GZA GeoEnvironmental, Inc. was engaged by MA DCR to conduct a detailed assessment of conditions of Fort Warren and related site features on Georges Island in Boston Harbor, Massachusetts. GZA’s scope of work included a review of the significant history of Georges Island and Fort Warren, a review of similar Third System forts, an assessment of the Site for safety and structural concerns, observation and documentation of general conditions of the Site, consideration for potential window closure options, observation of code and Americans with Disabilities Act (ADA) compliance issues, and recommendations to address items observed during field activities. GZA documented field observations in a geospatial database, using mobile GIS, to provide a viable and useful way to sort and view the observations. This database is to be utilized by the DCR as an asset management tool in the future as a way to document changes in conditions, repairs, and operational/seasonal needs and is accessible via a web application from desktop and mobile devices. ABSTRACT: Almost exactly a year ago, Educators from the University of Connecticut shared three “cool, cheap and easy” smartphone mapping apps at NEARC. The ultimate goal of using these apps was to allow budget conscious organizations to collect spatially referenced field data, notes, photographs and forms and maintain and publish these data in the cloud. The path to get there required at least two different apps. In an effort to emphasize the “easy” part, UConn’s Center for Land Use Education and Research (CLEAR) set out to develop (with the help of savvy computer science students) our own field data collection app. The result is TractNotes, an app for Android devices (and hopefully iOS soon) that simplifies data collection and eliminates the need for clunky GPS receivers, clipboards, cameras, pencils, backpacks, audio recorders, compasses, a degree in GIS or deep pockets. This presentation will showcase the TractNotes app, the journey it took to develop it, and how we envision it being used for a wide variety of field data collection needs on a budget. ABSTRACT: The parcel fabric was introduced by ESRI in ArcGIS 10. It has been adopted by many municipalities for improving, enforcing, and maintaining an increased level of spatial accuracy in their land records data. Despite the benefits, there are still many who are slow to adopt or hesitate implementing because of the perceived complexity of the process and supporting maintenance. This presentation will provide information to demystify the parcel fabric and all the moving parts and pieces involved. ABSTRACT: Active geomorphic features of the Connecticut River in New England provide habitat for several floodplain species. An object based segmentation model in GIS was created to identify and map sandbars through orthophotographs for the entire Connecticut River and its major tributaries. The multi-stage model, segments pixels from aerial images based on proximity and color, then compiles these pixels representing sandbars together through an unsupervised classification. Spatial habitat information on New England’s floodplain plant and animal species was collected to identify where sandbars provide critical habitat. Human development, particularly dams and channelization, have altered flow and sediment regimes, thus impairing formation of sandbars. Information regarding sandbar location and species presence in these features will subsequently allow policy makers to identify places for conservation. Large scale automated mapping of the geomorphology in both general river ecosystems and the Connecticut River is necessary to understand the dynamics of these features and preserve habitat. ABSTRACT: The University of Connecticut’s Center for Land Use Education and Research (CLEAR) has a long history of making applied research results both usable and accessible to audiences covering a wide range of technical ability. The Story Map is the latest and perhaps most compelling way to make technical information available to local decision makers, regulatory agencies, the public, students and everyone else. CLEAR’s Story Maps showcase everything from wildlife to stormwater regulations to tracking trends in land cover and landscape change. This poster highlights these along with CLEAR’s new Story Map gallery. Check it out at http://clear.uconn.edu/storymaps. ABSTRACT: Stormwater runoff can create significant discharge of scour and sediment buildup, leading to pollution of local waterways and contamination of drinking water. Cape Cod’s already sensitive coastal resources need stormwater solutions that include landscape management alternatives to help mitigate nutrient and pollutant loading. An assessment of existing vegetation was conducted within Massachusetts’ Route 6 right-of-way from the Sagamore Bridge in Sandwich to the Orleans/Eastham Rotary. Using a combination of high-resolution aerial photography and LiDAR data, plant species were classified, invasive species were located, and density and health of vegetation was evaluated for future landscape management planning. ABSTRACT: The Nauset Marsh barrier beach spits are part of an Atlantic-facing estuarine system within Cape Cod National Seashore. Inlet migration and coastal retreat have resulted in enormous changes in land cover types at Nauset. In the past 70 years, approximately 150 meters of shoreline retreat and 2.5 kilometers northward inlet migration have been observed. A major redistribution in landcover was mapped in the marsh, including loss of salt marsh habitat connected to the spit. This study seeks understand what patterns may be present in this system and to quantify the effects of these patterns on salt marsh and dune environments. This project was conducted using GIS software to analyze various aerial photographs from between the years of 1947 and 2014, and using said software to classify various land cover types in the study area. This data has been compared in a time series, and has been used to analyze some of the major trends shaping the development of the spit. The results of this project are important not only for the general understanding of the Nauset Marsh system, but for the overall understanding of how Cape Cod’s salt marsh/barrier spit systems affect uses and management within Cape Cod National Seashore. ABSTRACT: Traditional Inverse Distance Weighting (IDW) uses Euclidean distances when weighting values associated with each interpolated raster cell. While this may be the simplest approach computationally, it may not be the most accurate way to represent the complex features and barriers in a real-world system. Using values from a least-cost-distance raster to represent the true distance can result in a more accurate interpolated surface. The poster outlines application methods for Inverse Least Cost Distance Weighting as well as advantages, disadvantages, and applicable situations. ABSTRACT: Throughout history, people have settled near rivers and in floodplains, placing communities at risk to flooding, as demonstrated recently by the detrimental impact of Tropical Storm Irene. An active area of research in water resources planning and management involves understanding and quantifying the benefits and costs of high flows in rivers. This study explores the potential of flood attenuation by enhancing floodplain storage in portions of the Connecticut River. The study looks at quantifying the benefits of floodplain storage through the use of a simpler Hec-ResSim model and a sophisticated Hec-RAS model. The Hec-RAS model, built in ArcGIS using Hec-GeoRAS, incorporates detailed LiDAR and orthogonal imagery, USACE collected bathymetry, and measurements taken in the field. The analyses confirm that increased floodplain capacity attenuates high flows, and the Hec-RAS model has the added benefit of being able to incorporate projections to alternative flows based on floodplain and land cover changes. The Hec-RAS model allows comparison of its more detailed result to that from Hec-ResSim, to determine if the simpler model is sufficient to estimate changes in flows. Both models are powerful tools that can quantify floodplain benefits and provide justification for floodplain conservation and restoration for city planners and conservation groups. ABSTRACT: Our research the last year has focused on an initial understanding of the way data is being collected and processed on bird telemetry data sets on USFWS Northeast coastal refuges and how the development of a spatially explicit database framework could work to address better data organization and decision support. Bird telemetry studies especially from radio telemetry require the processing of big data sets and estimating movement locations. A common question coastal refuges face is whether wind developments could pose threats to known bird populations. This a complex question for biologists to answer without an inventory of data and a structured approach to processing multi-dimensional data. Our presentation will explain our big data approach, and modelling for a case study in the Gulf of Maine. ABSTRACT: This year MassDOT issued the Complete Streets program, setting aside funds for towns able to demonstrate their eligibility for respective projects. Planning for Complete Streets (CS) aims at making communities more walkable and more accommodating for bike travel and enhanced transit services and as such more livable whilst providing for safe and accessible multi-modal travel. This poster shows the CS planning approach, conducted GIS analysis, prioritization criteria and results for one of the towns participating in the program. Together with Green International, we assisted towns with developing the necessary steps for their Complete Streets Prioritization Plans. Starting with the assessment of the current transportation situation and based on research and crash information, a needs assessment was conducted. Then, we ran a gap and vulnerability analysis’ for specific locations. Based on the analysis results, areas for improvement were identified and CS project ideas developed. Using our prioritization strategy allowed towns to identify opportunities and CS projects most relevant for their community. Those CS projects deemed to make streets safer, more accessible and more complete are now potentially eligible for funding from MassDOT. ABSTRACT: A shaded relief map of Connecticut is displayed using a statewide elevation dataset created from eight different Lidar datasets that were captured at different times by different agencies. The mosaic dataset is used extensively to manage thousands of DEM tiles and LAS files of the different datasets and then pull them together into one ArcGIS Server image service with multiple functions (hillshade, shaded relief, slope and aspect) applied. The image services are available through REST as well as an easy-to-use viewer. The Connecticut Environmental Conditions Online (CT ECO) website is the home of the Elevation Viewer that contains all elevation layers, locators and swipe. The site also contains instructions for connecting to the services, metadata, FAQs and more http://cteco.uconn.edu/lidar. ABSTRACT: In the Northwest Pacific tribal areas of the Columbia River Basin, fish consumption is important to riverine tribal cultures, and represents deeply held beliefs that have roots in spiritual practices, subsistence lifestyles and community. Therefore, typical fish consumption may exceed levels usually reported for the general U.S. population. A principal exposure pathway of contaminants to riverine tribes is through fish consumption.This study was designed to determine if mercury concentrations in fish in regions of the Columbia River Basin where tribal members fish were high enough to be a health concern. A large Columbia River Basin database on concentrations of mercury in fish, compiled mainly from state and federal monitoring programs, was used to evaluate trends for mercury contamination in fish from the Columbia River Basin waterways for a range of consumption rates. Trends were analyzed on data aggregated by site and by state, using samples of the same fish species. Site-based trends were evaluated from 1999 to 2010. There were significant and important differences in mercury levels among species, but the locational differences were relatively small. The highest mean mercury levels were in largemouth bass (577 ppm) and smallmouth bass (297 ppm). The concentrations of mercury in the anadromous fish were lower than in resident species. Eleven of the 105 rivers had fish samples over EPA human health guideline of 0.3 ppm, and five of 105 rivers had fish samples above 0.5 ppm. The findings from this study demonstrated few fish are low enough in mercury to be safe for tribal members eating resident fish at traditional historic rates or at a moderate rate. Mercury contaminate levels in proximity to Native Americanreservations, per EPA human health guidelines for fish consumption were geospatial analyzed. Geographic relationships of Indian reservations and toxic release facilities throughout the Columbia River Basin were examined.The traditional methodology of a health risk assessment used by the federal government is based on the use of exposure assumptions that represent the entire American population. To limit human risk to mercury residues in locally caught species, fish consumption advisories have been established to protect local populations from health risk. For regions where mercury contaminant levels are elevated, elevated fish consumption by tribal members may lead to higher exposures to mercury. These exposures represent potentially disproportionate risks for many Northwest Pacific tribes. The state’s fish advisories suggest reducing fish consumption with the goal of lowering risk; in fact, this shifts the burden of avoiding risk to the tribal members who now carry the burdens of contaminant exposure, socio-economic impacts and heritage and cultural loss. Thus, tribal members are forced to choose between culture and health. Many tribal members would rather be exposed to risk than abandon their culture and religion. These issues represent the potential inadequacy of health risk assessments to reflect important cultural differences in environmental justice communities. This may warrant further mitigation to reduce mercury levels in surface waters that support commonly consumed or culturally important species. ABSTRACT: Creating accurate and quality maps of Torres del Paine National Park and KarukinkaPark on the island of Tierra del Fuego is important for the management, managetourism and providing funding for the Chilean Forest Service (CONAF) and theWildlife Conservation Society (WCS). This also supports the local economy in themany small local businesses near the parks. Good maps and data outside the parksreduces visitor usage inside the parks and provides more opportunities for localbusinesses. In addition the enhances geographic data allows visualizing landownership, land-cover, hydrography, infrastructure and imagery utilizing GIS is away for both local and regional government to properly manage these resources.Data is of varying quality throughout the region. Sections including northern Tierradel Fuego have been surveyed to define property boundaries, others may be basedon old surveys, fences, property descriptions, air photos, satellite imagery ormissing. Concerning land-cover – this is sometimes is misidentified. Streams orwater bodies can be miss-aligned, shaped or identified.And a good excuse for me to get out and map! The GeoDev Meetup event is a social gathering for developers to discuss the latest in mapping, geo technology, geo services, web and mobile mapping apps, app design, cloud solutions, map data or anything else related to solving real-world "geo" problems. Meet cool people. Duh, we're there. Make a name for yourself in presenting an cool new/interesting concept or idea. 8:00 - 8:30 PM Raffle, Networking and Social. We will be raffling off a free registration pass to attend the 2017 Esri DevSummit. Following the Vendor Reception & Poster Social, head to downtown Falmouth to dine at one the recommended establishments. Check out the interactive Dine Around Story Map at gis.camb.ma/2016dine, or see map below. From 8:30 PM – 11:30 PM please plan to join your fellow NEARC attendees at Grumpy’s Pub for live music by DEVIOUS, a classic rock & roll cover band! Transportation provided as follows: Downtown Falmouth is approximately a 15-minute drive from the hotel. Shuttle transportation will be provided and we encourage you to utilize it. The buses will depart from the hotel beginning at 6:30 PM and run until 7:30 PM. The drop off location will be the Morgan Stanley Building, near #10 on the map. The shuttle bus is also available to bring people from Morgan Stanley to Grumpy’s beginning at 8:20 PM. The last bus returning to the hotel from downtown will be at midnight. 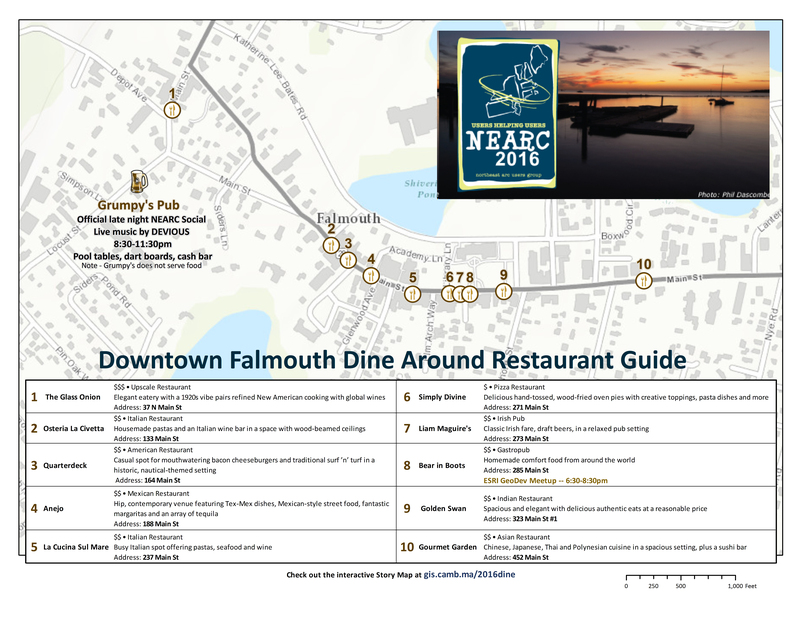 View the NEARC Dine Around Falmouth Story Map. David Gallo is an American oceanographer and explorer. He is currently Senior Advisor for Strategic Initiatives at the Center for Climate and Life of the Earth Institute at Columbia University. Previously he was Director of Special Projects at the Woods Hole Oceanographic Institution - a preeminent, globally recognized scientific laboratory. For more than 30 years, David has been at the forefront of ocean exploration, participating in and being witness to the development of new technologies and scientific discoveries that shape our view of planet earth. He has been described by TED Conferences as “an enthusiastic ambassador between the sea and those of us on dry land.” With more than 12 million views his TED presentation “Underwater Astonishments” has been among the top 10 viewed TED Talks. David has participated in expeditions to all of the world’s oceans and was one of the first scientists to use a combination of robots and submarines to explore the deep seafloor. Most recently he co-led an expedition to create the first detailed and comprehensive map of the RMS Titanic. He also co-led the successful U.S. effort to locate the wreck site of Air France flight 447 and is presently involved in the search for missing Malaysia Air flight 370. David is becoming increasingly outspoken about the relationship between humanity and the sea. He feels strongly that instead of taking the oceans for granted we need to recognize the oceans critical role in providing the air we breathe, the water we drink, and the food we eat. At the same time, Dr. Gallo feels that human activity has impacted the ocean on a global scale and with significant consequences. The oceans hold the clues to our past and the key to our future yet they remain mostly unexplored and poorly understood. Dr. Gallo is personally committed to conveying the excitement and importance of ocean exploration to the public-at-large. He has lectured internationally to audiences ranging from children to CEO’s with the goal of awakening the little bit of Jacques Cousteau and Jules Vernes that resides in each of us. He has given 8 TED and more than 15 TEDx presentations and has appeared in numerous documentaries (Discovery Channel, History Channel, National Geographic). He has also been featured on numerous televised news programs (Weather Channel, PBS Need to Know, MSNBC Ed Show, NBC Today show, and Face the Nation). He is currently a CNN Ocean Analyst and is regularly featured on Anderson Cooper 360 and New Day. In recognition of his role in exploration and communications David is a 2014 recipient of the Explorer’s Club Lowell Thomas medal. He is a co-recipient of a Computerworld-Smithsonian Award, an elected Fellow of the American Association for the Advancement of Science, a National Fellow of The Explorers Club, a TED-All Star, and a recent recipient of the Lotus Club Distinguished Achievement Award. ABSTRACT: We all know that GIS allows us to learn more about where, why and how things happen - but we also know how challenging it can be to sort through a variety of large or complex datasets looking for that understanding. Insights for ArcGIS is a new application that will change the way you work with your data - it provides a new interactive analysis environment that puts the focus on the visual exploration of your data to gain better understanding - and insight. ABSTRACT: Rivers in the Northeast contain hundreds of aging dams which no longer serve their original purpose, are not up to design standards, and often need to be removed. Municipalities and industrial land owners across the Northeast have had to address the challenges of aging dams for decades and will continue to address them in the future. Gomez and Sullivan has conducted numerous dam removal feasibility studies and removals across the Northeast in response to these challenges. ArcGIS is an integral tool in supporting this process. This presentation will focus on how ArcGIS has been utilized in support of municipal dam removals in the Northeast. Discussion will focus on field data collection including bathymetric and site surveys which utilize various GPS and mobile GIS technologies; post processing of bathymetry data and development of terrains using ArcMap and ArcScene; and development of a hydraulic model using HEC-GeoRAS, an ArcGIS extension. Once developed, the hydraulic model is used for a variety of purposes ranging from examination of the existing hydraulic conditions (dam in place) to examination of the anticipated future hydraulic conditions (dam removed). Examples of other ArcGIS and hydraulic modeling applications will also be provided including fish passage and other environmental studies. ABSTRACT: Large organizations like the City of Philadelphia have many departments with large facilities portfolios to manage. Each of these departments may have their own systems to track facilities operations and maintenance expenses. Each also has their own facilities-related capital investment needs. The City of Philadelphia is using GIS to harvest facilities data from a wide variety of different systems and organize them using location as the organizing principle. Using this approach, the Mayor's office can make better informed facilities capital investment decisions across the entire city portfolio rather on a department by department basis. Stu Rich will discuss the value that the City has received from this approach along with some of the challenges encountered along the way. Technical Session. MassOrtho: Lessons Learned and Other Interesting Musings from the Tale of a Regional Ortho Project. Please Come and Learn from This! ABSTRACT: The Massachusetts Orthoimagery Consortium was well intentioned and had the support of 60 communities in Massachusetts, with collaborations from state and regional entities. The magnitude of the project area and potential to create a lasting initiative was impressive. This thing had legs! Little did we realize the perfect storm was brewing. Come find out what happened next and help us find the silver lining by learning from this experience. You'll laugh, you'll cry, you'll learn lessons that can be applied to most project management scenarios. 1) Pictometry ArcGIS Desktop toolbar - allowing for retrieval, display and analysis of a Pictometry-captured oblique or orthogonal image from a desired location. 2) ArcGIS uploader for Connect - allowing Pictometry users to upload GIS data directly to their Pictometry CONNECT cloud-based viewer directly from an MXD, therefore maintaining symbology. 3) We will also review the recently released Pictometry for ESRI Web AppBuilder integration. ABSTRACT: The use of Unmanned Aircraft Systems (UAS) within the National Air Space is fraught with controversy including safety and privacy concerns and complex regulatory rulemaking. But the social and ecological benefits of their use are enormous, from disaster response and search and rescue missions to wildlife surveys and shoreline erosion studies. The twenty-eight Reserves that comprise the National Estuarine Research Reserve System have been struggling individually with the issue of UAS missions for several years.This year, a UAS Roadmap was published as a resource for all of the Reserves and their partners. This Roadmap explains this complex situation clearly and concisely and provides resources that enable each Reserve to progress at their own pace with developing UAS projects. Proof of concept projects that focus on precision and accuracy of the resulting products are scheduled to occur at five Reserves within the next year. This will also enable clear procedures and protocols to be established that will ensure safety and privacy considerations and adherence to current regulations are built into mission planning at all levels. This talk will give an overview of the current UAS situation and showcase its use in fulfilling Reserve missions across the United States. ABSTRACT: As LiDAR data permeates the mainstream, its use and utility is becoming much more widespread and diverse. As a spatial commodity, LiDAR is the raw material from which a wide variety of 3D datasets are generated. Using a series of customizable algorithms applied to the geometric structure and other attributes of the point cloud, buildings, vegetation, utility cables, and other features can be effectively identified, classified, and ultimately extracted into vector models of the features they represent. Subsequently ground points can be isolated and gridded to form an accurate terrain model as the basis for precise volumetric calculation, terrain analysis, and change detection. In this workshop, we explore the workflow whereby features are identified and extracted from publicly available data. We walk through the procedures for point cloud filtering and noise removal; identification and automatic reclassification of ground points; 3D building model creation; height calculation of forest canopy and individual trees, and delineation of above-ground utility cables. We will also demonstrate the workflow for manually digitizing identifiable objects in a 3D environment. ABSTRACT: Drone technology is fundamentally changing long-held field work practices and business models, and enterprises are learning how to effectively leverage this emerging technology. With Drone2Map for ArcGIS, drones become more than just image capture devices – they are enterprise GIS productivity tools. During this session we will demonstrate how to create orthomosaics, point clouds and 3D meshes with Drone2Map for ArcGIS, and quickly share the results with your organization. ABSTRACT: Prioritizing replacement of water mains can be a challenge, especially in New England with water mains dating back to the late 1800’s. Past methods for prioritization typically involved a simplistic formula of counting past breaks and the age of the water main, however this method does not take into account many of factors that influence a water mains lifespan. The new method of prioritization takes into account the consequence and likelihood failure. These are then combined to establish a risk score for each individual asset that is used to prioritize replacement.The likelihood of failure is established using the Linear Extended Yule Process (LEYP) statistical model to predict the number of failures within a specified time interval. The consequence of failure assesses the impact a failure may have on the ability to deliver water, disruption to the public, and damage to other assets. The Risk score is computed using a bi-direction matrix of the consequence and likelihood of failure values. The process utilizes a series of GIS-based tools to effectively manage and present the data in an understandable format. The tools are adaptable, repeatable and efficient for developing a comprehensive assessment of an entire water main system. ABSTRACT: The winter sport industry is an important part of the New England economy as well as an integral component of the New England psyche. The impacts of climate change has caused great uncertainty in the industry and will require economic and technologic innovations to deal with the fluctuations in the length of the winter season, temperature variation and snow pack fluctuation. To examine in detail the continuing changes at the largest ski resort in Massachusetts, the Earth Science program at Worcester State has entered into a cooperative monitoring and assessment program with Wachusett Mountain ski resort and the Mass Department of Environmental Conservation. Continuous monitoring weather stations and soil probes will be installed on Mount Wachusett and vegetation and small mammal surveys will be conducted to examine the environmental and physical changes that have occurred and will occur. Technical Session. Big Data Is the Answer... What Is the Question? ABSTRACT: “Big Data” is a generic phrase that is often used to describe what people are doing with extremely large amounts of data, but the concepts behind it are not often understood. This presentation will provide an overview about Big Data and answer a number of questions including; What is Big Data? How does Big Data work? What is being done with Big Data and how is it different from traditional data and approaches to solving problems. It will also cover some of the latest advances in Esri technology that will make it easier for us to work with Big Data. ABSTRACT: What do you get when you combine shiny, new servers with new and enhanced web apps, maps, services, loads of imagery, Lidar, vector layers and an attractive website? The new Connecticut Environmental Conditions Online (CT ECO)! The University of Connecticut Center for Land Use Education and Research (CLEAR) and the Connecticut Department of Energy and Environmental Protection (DEEP) have updated the CT ECO website from the front end to the back end. CT ECO is a website designed to make Connecticut’s geospatial information available to a wide range of users. Come hear about the improvements and how the pieces are being integrated to create a satisfying user experience for newbies and professionals alike. ABSTRACT: Airborne Topo-bathy LiDAR has become more widely used in recent years to assist in the management of water (coastal and river) projects either for maintenance, like floodplain mapping, or incident response, like in the wake of Hurricane Sandy. We will discuss what Topo-Bathy is, how it is acquired, and what dataset can be generated to assist your municipality. ABSTRACT: ArcGIS Maps for Office is an application integration that enables the use of Esri’s Location Platform, ArcGIS with Microsoft Office. You can quickly create dynamic, interactive maps of your Excel data and start exploring your data in a whole new way. This workshop will demonstrate the value of the product using a number of use case scenarios as well as the key new features of the latest releases. ABSTRACT: In the fall of 2011 the City of Hartford went out to bid for a large document scanning project. The project covered plans and documents created between 1894 – Current that are stored in various locations in the City. The documents to be scanned included: Permits, Housing Code Violations, Building Code Violations, Planning/Zoning Documents, and small/large format Architectural drawings. The project was funded in 2013 as a four year project and it is currently ongoing. This presentation will cover the project setup, indexing, storage/backup, and document retention/archiving. ABSTRACT: This presentation will offer a road map for implementing a new ArcGIS Open Data website. The University of Rhode Island Environmental Data Center is developing an ArcGIS Open Data website on behalf of the Rhode Island GIS (RIGIS) consortium, building upon the consortium's adoption of an open data distribution policy in 2014. Although the standard RIGIS data distribution website will live on, we believe that an ArcGIS Open Data site will further expand the RIGIS user base and be more inclusive of prospective users and developers who do not necessarily work with Esri software and data formats. During this presentation I will focus on the process of getting an ArcGIS Open Data site up and running. First, I will discuss data preparation – creating field aliases and removing empty or sparsely populated fields. Then I will discuss metadata preparation – ensuring metadata have been exported from ArcCatalog in the ArcGIS metadata format so that it can be imported to ArcGIS Online. Finally, I will discuss some of the logistics of creating an ArcGIS Open Data site, including creating and assigning groups, and uploading data to these specially designated groups. ABSTRACT: Current and accurate maps are an important tool for making use and management decisions regarding land and water resources. With ongoing concerns of sea level rise and coastal change, accurate information about the structure of the coastal upland and nearshore subaqueous environments is an important tool in planning for the future of these areas. The National Cooperative Soil Survey has is responsible for documenting the nation’s soil resources to be used in making land use interpretations. In recent years, the need for coastal resource assessments has led the soil survey to update the mapping in certain areas to include more detailed information on the soils of coastal uplands, salt marshes, and subaqueous soils beneath shallow water (generally < 5 m). Seamless maps of the coastal and shallow subtidal soil types have been created and interpretations are in development including flooding hazard, dredge disposal concerns, mooring field construction, shellfish habitat suitability, and eelgrass replanting suitability. Methods for mapping these soils include use of LIDAR and bathymetric data as well as a significant element of field data collection and lab analysis. ABSTRACT: Five years after its humble beginnings in 2011, the Vermont Lidar Initiative (VTLI) has achieved full state lidar coverage (including both available and in-process data) with the help of various state and federal partners throught the USGS Broad Agency Announcement grant under the 3D Elevation Program (3DEP). Once the current lidar “collection” is completed in 2017, Vermont will have 80% of its land area covered by Quality Level 2 (QL2) data and the remainder at the QL3 level.While data collection efforts will be ongoing to maintain the “QL2 coverage every 8 years” recommended by the 2012 National Enhanced Elevation Assessment, the VTLI’s primary focus is evolving to embrace a wider range of data dissemination strategies that best serve myriad applications across a broad range of users. In addition to a brief overview of data acquisition and how the dissemination options evolved from data product and file download to the advantages of our new web services, use cases will also be highlighted.The VTLI is managed by the Vermont Center for Geographic Information (VCGI), formerly a public non-profit and now a Division of the State Agency of Commerce and Community Development (ACCD). ABSTRACT: The American Society of Civil Engineers estimates that by 2020 an investment of $3.6 trillion is needed to maintain our nation’s infrastructure in state of good repair. However, it is also estimated that there will be a funding gap of $1.6 trillion (ASCE, 2013). To efficiently utilize limited funding, GIS web platforms allow cities and state agencies to better maintain and monitor the health of their infrastructure and assets. ArcGIS’s web-based Flex interface can be used to create a customized web portal. This type of system, combined with recently collected infrastructure data, can utilize a suite of custom spatial analysis tools to better visualize data, develop statistics, and create data driven repair decisions to efficiently allocate funding. The City of Beverly employs such a web based application and has effectively used the GIS spatial analysis and visualization tools to maximize repair funding. The City also incorporates much of their own infrastructure and asset management data into the web portal to assist in the visualization of problem areas. Such real-world applications suggest that future expansion of web-based GIS platforms can increase the efficiency of repair decisions and methods which can have a significant impact on the health of the nation’s infrastructure. ABSTRACT: Collector for ArcGIS gives you a powerful and easy to use app that runs on iOS, Android, and Windiws10 devices, to perform field data collection tasks. Learn how to collect data live or offline. Additionally, learn important design considerations for your web maps, feature services, and what desktop tools can be used. ABSTRACT: The City of Cambridge has been working on integrating 3D into the GIS workflow for the past several years. Many of the technical challenges of working with 3D maps have improved significantly as both GIS software and computer hardware have evolved. The Cambridge 3D project has focused on 3D data development, internal workflow within City departments, interactive mapping, and a 3D Web page with data download capabilities. The City now has a plan in place for data maintenance and for developing a 3D city map which will be integrated with 2D GIS and related tabular data. In this presentation we will look at all aspects of building a 3D model, collaborating with our Community Development Department, creating a workflow for both staff and the developer community, building a 3D program within the GIS framework, getting 3D out to the public, and the road ahead. ABSTRACT: VHB was hired by The City of Boston to build an inventory of the shadow conduit and dark fiber resources at the City’s disposal, included Boston Transportation Department collected assets that exist in the City of Boston. To integrate seamlessly with the City’s existing infrastructure, ESRI’s ArcGIS Platform was used throughout the development, creation and presentation of the product. Making the data available about the fiber assets will foster the first use and development of the assets that have been installed since 1998 for the City of Boston. The project included:• Retrieving 20+ year old source materials required to create the inventory;• Building a flexible data model in ArcGIS Desktop to support the characteristics that need to be collected;• Creating an inventory from documents provided by the city; and,• Developing an ArcGIS Online application for retrieval and display of the collected data.The presentation will describe the project, discuss the benefits and advantages of the chosen approach and demonstrate the end product. ABSTRACT: Automated feature extraction of small, irregularly-distributed landscape features has long been a challenge for remote sensing-based land-cover mapping. Natural features such as vernal pools and wetlands may be obscured by vegetation or easily confused with other landscape elements, complicating feature discrimination and reducing classification accuracy. Anthropogenic elements such as previously-unmapped logging roads are similarly difficult to identify and then isolate from other linear features. The growing availability of high-resolution imagery and LiDAR is changing this dynamic, however, especially when these datasets are combined with object-based image analysis (OBIA) techniques. In a series of projects in Vermont and other northeastern states, we developed OBIA modeling routines that improved capture of these difficult-to-map features, using LiDAR-derived digital elevation models (DEMs) to first identify candidate features and then evaluating them with a combination of object characteristics and contextual criteria. The high-resolution DEMs were essential to mapping workflows, permitting characterization of fine-scale landscape transitions with compound topographic indices (wetlands), slope-derived depressions (vernal pools), and geomorphometric indices such as landform and dissection (logging roads). Overall, modeling focused on over-prediction (errors of commission are much harder to diagnose) and was efficiently performed on large geographic extents (county-sized) using the enterprise processing capabilities of OBIA software. ABSTRACT: NOAA’s Office for Coastal Management (OCM) provides technical assistance, data, tools, and training to the coastal management community. Through its Coastal Change Analysis Program (C-CAP), OCM has been producing moderate resolution land cover for almost two decades. Over the past 5 to 10 years, OCM has also worked to establish an operational higher resolution land cover product line. These products bring the national C-CAP framework to the local level, enabling additional, site specific applications. Recent increases in imagery and LiDAR data availability and improvements in processing techniques are enabling more cost-effective production of high resolution land cover products. This presentation will describe techniques NOAA and its partners are using to develop detailed land cover maps across broadening geographies. Technical Session. If You Could Tell a Story with a Map, What Story Would You Tell? ABSTRACT: Whatever your field, Story Maps can be a powerful way to connect with your audience. A Story Map is a multimedia format that allows for the integration of interactive webmaps, images, weblinks, and video into a single visual presentation. The use of Esri Story Maps is expanding across sectors and disciplines. People have been creating these maps for a wide range of purposes, including: analysis, introducing your employees to colleagues, the public or your customers, outreach and advocacy, highlighting environmental issues, explaining the results of research, and generally sharing maps and the results of geospatial projects. In this panel we will explore the range of applications for Story Maps in different disciplines. Our panel members, hailing from state government, traditional academia, and an outreach organization, have all used Story Maps or helped others to do so. In addition to highlighting how these maps are used by different constituencies, we will also consider how different Story Map formats might best suit specific needs. We will share some of our best practices, as well as, highlight some common pitfalls. We also hope to bring different views into the conversation by learning about the Story Map work of audience members. ABSTRACT: Survey123 for ArcGIS is a simple and intuitive form-centric data gathering solution that makes creating, sharing, and analyzing surveys possible in just three easy steps. First: Ask Questions. Quickly design powerful surveys and publish them into ArcGIS. Second: Get the Answers. Enable your workforce with the Survey123 for ArcGIS mobile app to capture answers in the field. Third: Make the Best Decisions. Analyze answers from the field in ArcGIS to support decision making. ABSTRACT: The primary goal of 3DEP is to systematically collect enhanced elevation data in the form of high-quality light detection and ranging (lidar) data over the conterminous United States, Hawaii, and the U.S. territories over an 8-year period. Interferometric synthetic aperture radar (IfSAR) data will be collected over Alaska. A 2015 USGS Broad Agency Announcement (BAA) established a competitive solicitation procedure for partnering with federal agencies for lidar acquisition. So far 3DEP has provided funds in partnership with 54 projects yielding over 200,000 sq. mi. of high-quality elevation products. This presentation will describe the program, review its impact on the northeast and highlight the tools used to make the program successful. ABSTRACT: Light Detection and Ranging (LiDAR) systems have great potential to facilitate monitoring of infrastructure and vegetation across large areas. In this research, we conducted a pilot study to explore the capabilities of using high resolution LiDAR (>25 pts / m2) to assess utility infrastructure and roadside vegetation in Connecticut. We further explored ways to reduce costs associated with LiDAR acquisitions in order to make recurring data collections more feasible. In the pilot study, a vendor acquired airborne and mobile LiDAR data for a 30 km2 area in Greenwich, CT. The vendor used the data to map poles, lines, and tree crowns from aerial data; mobile data were used to inventory and assess pole attachments as well as measure pole lean and height and assess vegetation near lines. In the pilot study, feature extraction costs were 50% of the acquisition costs; to reduce collection future costs, we are developing in-house computer programs for mapping utility infrastructure and vegetation. We are also exploring opportunities for agencies to partner in LiDAR acquisitions to maximize benefits as well as minimize the cost for any given agency. Future research will explore other technologies (e.g. Geiger LiDAR), that may provide more cost-effective alternatives to conventional LiDAR. ABSTRACT: As the regional land use planning and regulatory agency for the County of Barnstable, Massachusetts, the Cape Cod Commission is responsible for preparing a Regional Policy Plan (RPP). The RPP articulates a growth policy for the region that strives to balance preserving the vital natural resources and historic charm of Cape Cod while strengthening the region’s economy. Key to this is a regional land use policy and vision map that aims to direct future planning efforts by focusing new growth and development in appropriate areas throughout the Cape while maintaining those areas that should remain as they are. The geodesign process has been used to identify centers of activity across the region that will be the major focus of future growth, using three main factors—civic activity, business activity, and physical form. Land use character was modeled and parcels were scored based on their form (building size, enclosure, etc. ), business activity, and proximity to community resources. The result is a map which identifies both regional and local centers of activities. With further location-specific information, planning efforts and capital resources can be more efficiently directed towards these centers across the Cape. AUTHORS: Kelsey Gabriel, Lee Curtis, George Andrews, Melissa Kaplan - BSC Group, Inc.
ABSTRACT: Climate change research continues to show that storms are intensifying, sea levels are rising, and areas are becoming more susceptible to flooding. As a result, National Grid is taking a proactive stance to implement flood protection measures at substations in MA and RI to allow the continuous, reliable delivery of electric service in light of future increases in flooding and storm events. In order to identify the high risk substations in MA and RI, BSC prepared various map sets including hurricane storm surge locations, sea level rise and coastal impact, limit of moderate wave action, and environmental resources. This preliminary GIS effort assisted National Grid in their planning, design, and permitting of temporary flood protection measures. BSC is now working to provide site specific inundation mapping, including sea level rise and storm surge, as National Grid begins to design permanent flood protection measures. These maps will take into account site specific criteria including topography, mean high water line, high water marks, and tides. Different scenarios, such as variations in sea level rise and hurricane categories, will be evaluated to create the resilient design solutions. ABSTRACT: Asset management programs are becoming essential to how local government, public works, utilities, infrastructure and facilities organizations measure and monitor their operations while providing better service to their customers. These organizations are realizing their assets' locations are critical business information that can reveal the spatial context of their work and generate enhanced analysis and forecasting capabilities. GIS is great fit for the role of enabling location within asset management (AM), but there are many factors to consider when developing the GIS component. We will cover essential guidelines to planning for a GIS-based AM program, including: setting up a new GIS for AM, upgrading an existing GIS to conform with AM systems, bootstrapping a new asset inventory from GIS, and continuing to support legacy applications while moving forward into asset management. Finally, we will review key factors for success while looking at the geospatial intelligence and other benefits that can be unlocked from this methodology. ABSTRACT: Workforce and Navigator are field data collection apps available to ArcGIS Online users. See how they work with Collector or Survey 123. Navigator uses Esri data as well as your own data to provide turn-by-turn directions to multiple stops for your workforce needs, while Workforce for ArcGIS is an app that will integrate field data collection (Collector), getting to work locations (Navigator) into an app that includes work order information for your teams in the field. ABSTRACT: Data visualization is an indispensable tool for understanding the nature and extent of contamination at contaminated sites. Such sites, especially large and heavily contaminated areas like superfund sites, have often been studied for long periods of time, and have decades’ worth of historical data for contaminant concentrations in soil, water, air, etc. Unfortunately, these data are often contained in myriad reports, maps, and files in various formats, from multiple labs and companies, and with varying degrees of legibility and data completeness. In addition, it is difficult to visualize years’ worth of data (often hundreds of samples) on traditional static maps, especially when the contamination at many sites is a complex 3-dimensional problem involving geology, groundwater flow, multiple contaminants, and multiple sources of contamination. To solve all of these problems, Stone Environmental has developed a systematic way of compiling all historic data into a single comprehensive site database and visualizing that data in 3D models and with ArcGIS online. These tools allow us to visualize highly complex and detailed sites in intuitive and data-rich formats that are easier to use, share, understand, and present than traditional methods. AUTHORS: Ian Sleeper, Terracon Consultants Inc.
ABSTRACT: The NRCS Soil Survey Database is a rich and detailed dataset with wide applications across many fields; however, the data is held in a complex relational database format which can be confusing to casual or unfamiliar users, and can continue to surprise even experienced users with its breadth and depth of information. Several years of experience with SSURGO data has brought to light several interesting uses that provide insight into both the wealth of data available and the capabilities and uses of a relational database to represent complex three-dimensional attribute information. Some uses include slope stability risk modeling, engineering project development overviews, pre-field-task planning, and other thematic mapping and analysis applications. These uses highlight the value of the SSURGO data in the application of geotechnical and environmental engineering (due to the nature of experience and educational background), but the data is equally applicable to other study areas such as Forestry, Natural Resources, Agriculture, Municipal Planning, and others, given the proper background knowledge. ABSTRACT: The Cape Cod Commission (CCC) GIS Department collects geospatial data and performs analysis for the County of Barnstable, Cape Cod’s municipalities, and non-profit agencies. Recently completed analysis is being promoted to conservationists to maximize the benefits of their preservation efforts related to purchasing open space. Towns voted to establish a land bank (1999-2005) to acquire land “for the protection of public drinking water supplies, open space, and conservation land, the creation of walking and bicycling trails, and the creation of recreational areas”. The land bank is now the Community Preservation Act.The CCC’s Regional Policy Plan and Development of Regional Impact reviews contain regulations to ensure that adverse impacts to wetlands and wildlife habitat are avoided, and that development proposed on undeveloped land requires acquisition of land with high natural resource values.As funds to purchase and protect land becomes scarce, conservation agencies need to prioritize purchasing undeveloped parcels that have the highest resource protection value.The Commission has long had natural resource maps to aid in evaluating land, but GIS capabilities allowed parcels to be prioritized with a count of the number of desired factors that overlay each individual parcel. This score helps rank the value of potential purchases. After a 10 year hiatus, we are back! Come join us for an informative and hilarious version of the classic game show Hollywood Squares, played NEARC style! Our “celebrity” panel comprised of current and past NEARC Presidents will educate and entertain the audience, as you compete for fabulous prizes while learning strategic information, tips and tricks about ArcGIS Online. This is a “must-see” event, so come take part in the crazy shenanigans and learn about ArcGIS Online… and maybe, just maybe you will even walk away with a cool prize. Paul Niedzwiecki has led the Cape Cod Commission in his role as Executive Director since 2007. He leads the agency in fulfilling its mission –“Keeping a Special Place Special”- by protecting the natural environment, enabling economic growth, increasing transparency and encouraging community engagement. Prior to joining the Cape Cod Commission, Paul was Assistant Town Manger in Barnstable, Ma. Special District Attorney for Barnstable County and General Counsel/CFO at Commonwealth Corp. He graduated from Suffolk University, received his J.D. from Suffolk University Law School and is a member of the Massachusetts Bar. Live music by singer/songwriter Alec Delphenich from Boston, MA. ABSTRACT: GeoEvent Extension for ArcGIS for Server connects to common sensors and data feeds, including in-vehicle GPS devices, mobile devices, and social media providers, among various others. Learn an overview of the technology, how to connect to real time data, transform it into a streaming service and access your feed through various applications. ABSTRACT: The opioid epidemic presents a major public health challenge and contributes to a larger syndemic, which includes non-prescription opioid misuse, heroin injection, opioid overdoses, and hepatitis C virus (HCV) and HIV clusters. Over the past decade, Massachusetts has experienced major syndemic challenges with increases in all opioid-related morbidities and mortalities, including an increase of 163% in fatal opioid overdoses, from 525 in 2005 to 1,379 in 2015, an increase of 137% in reported HCV cases among 15-29 year olds, and elevated HCV infection rates among Baby Boomers, born between 1945-1965. As this syndemic continues to grow, it may be a harbinger of future increases in HIV and HIV-HCV co-infection rates. Little is known, however, about the overlapping spatial distributions of these disease outcomes and geographic clustering patterns. We combined surveillance and primary data to map and derive a greater understanding of the Massachusetts syndemic. Through the use of various GIS and spatial epidemiological methods, we identified spatial hotspot clusters (p < 0.05) on the neighborhood, census tract, municipality, and state levels. We identified locations where injection drug use, overdose, HCV and HIV clusters were a concern, and where enhanced prevention, treatment, and care can help combat the opioid epidemic in Massachusetts. ABSTRACT: GIS was once the best kept secret in government, but forces like the iniquitousness of the web, easy to use applications, mobile devices, abundance of data and higher expectations have combined to changed that. Policy makers have discovered the power of GIS to inform policy making and better communicate with constituents. Government leaders now realize that GIS can transform big data and can visualize it and make it easier to understand. Which can then drive evidence based decision making and help evaluate policy impacts by geography. In the U.S., both the White House and Congress now use GIS to shed light on the nation’s most pressing challenges. Issues like spending, labor, healthcare, energy, environment, and border security all have geographic components and affect citizens everywhere, maps help communicate these issues in an interactive way. More and more, maps provide the bridge connecting policy makers with the public, and open data efforts are fueling the creation of more impactful maps than ever before. ABSTRACT: A MapBook can export maps showing the same data for different geographic extents but not different data for the same extent. For Maine’s 2015 State Wildlife Action Plan (SWAP), we needed to produce a geographic range map for 354 “Species of Greatest Conservation Need.” These maps combined presence/absence data and the distribution of potential habitat to predict where each species could occur. Expecting this to be an iterative process as the input data, layout design, and SWAP evolved (many times), we used Python to automate the work. Steps for each species included: 1) standardizing data across multiple input sources; 2) combining data while retaining the source for each observation; 3) overlaying the observations across Landscape Sample Units (LSUs = Maine townships for terrestrial species and sub-watersheds for aquatics); 4) calculating the proportion of potential habitat in each LSU; and 5) generating a map with the species’ name, a custom legend, potential habitat distribution, and presence/absence in each LSU color-coded by data source. By automating this process, we could create a new generation of maps after each public meeting. We used persistent data dictionaries and log files to allow partial runs and resume-where-you-left-off-when-it-crashed processing, respectively. ABSTRACT: Have you ever tried to get a Public Works Director or Utility Superintendent to discuss your geodatabase utility template? First of all, you would be lucky if that request did not scare them off completely. Secondly, they are hoping GIS is going to streamline their operations and not require additional meeting time. Sitting in a meeting filled with technology jargon involving field names, relationships and whether a value needs to be an integer, text or blob value is far from anything they would agree to. So, how do you get your utilities into the Esri utility templates? Please join us, in an open presentation format, as we discuss our experiences with and share our tips on making these templates work for DPW and Utilities alike. We hope this forum will foster questions, create dialog and initiate ways to raise local adoption of these valuable utility templates. ABSTRACT: As ArcGIS continues its evolution from a desktop, to client-server, to web GIS architecture, the complexity of the supporting software stack is increasing. Usually, things work fine - but sometimes they don't. When users report poor performance, is the problem the network? The database? A poorly designed map service?This session will help GIS managers, analysts, developers, and others responsible for maintaining their ArcGIS infrastructure understand the tools and techniques available for monitoring and quantifying system performance at various tiers of the software stack. The presentation will discuss popular ArcGIS deployment architectures, and include live demonstrations analyzing common performance bottlenecks. No prior performance analysis experience is required, though a working knowledge of ArcGIS will be helpful. Please note: this is a 3-hour workshop that runs from 8:45 a.m. - 12:00 p.m. BYOD. Special Events can present unique challenges to the Public Safety community and require that different agencies work together to provide a safe experience for all types of Special Events. This workshop will focus on how to support Special Events with ArcGIS Online. This enables planners to operationalize traditionally static content in mission focused applications so that this information provides context for the situation during the event which results in faster decisions during the event due to the thorough understanding of the context of the situation. The presenters will share lessons learned and experiences from past events and discuss a range of ArcGIS information products that have proven very useful, including Operations Dashboard for the Command Center, Story Map Journal for briefings, and Collector for ArcGIS for getting information in to and out of the field. Attendees will learn about the collection of ArcGIS resources, templates, and tools that are available to help their communities be better prepared and more successfully support Special Events, large or small, in their jurisdiction. This will be accomplished both through presentations as well as hands on exercises. Please bring your own device to the workshop. ABSTRACT: Web GIS is a type of distributed information system, comprising at least a server and a client, where the server is a GIS server and the client is a web browser, desktop application, or mobile application. In its simplest form, web GIS can be defined as any GIS that uses web technology to communicate between a server and a client. See how ArcGIS for Desktop, ArcGIS for Server, ArcGIS Online, and Portal for ArcGIS can independently, or in concert, provide you with the WebGIS solution. ABSTRACT: Presenting spatial information through maps and figures is a common task performed by the GIS community. Often, there is a need to create dozens of maps to accurately relay information on the topic of interest. This presentation demonstrates an approach to automating the task of creating maps in ArcGIS using Python. Following the generation of a template map in ArcGIS, a python script can be used to manipulate the data sources for each layer in the template, the titles and text, map extent, definition queries on data layers, and the locations of graphical elements. This approach allows the user to export hundreds of maps and change elements in each map without opening ArcGIS, and with limited manual effort. Automating map generation reduces human error and increases efficiency. A demonstration of the capabilities of map generation using Python will be held during this presentation, as well a high-level description of the code written to perform such tasks. Finally, other advantages of automated map generation will be highlighted, including the ability to use several standalone maps to create videos (AVIs), to show a time series of an oil spill over a number of hours. ABSTRACT: The GIS Certification Institute (GISCI) and its Member organizations have supported the creation and evolution of the GIS Professional (GISP) certification program for over a decade. The GISP certification process has evolved and matured over this time, with the most recent change being the introduction of a certification exam. This presentation will outline the requirements of the GISP certification program, with specific focus on recent changes that will impact existing and new GISPs. ABSTRACT: During an emergency, geographically diverse partners must collaborate to execute a unified response. Establishing common ground is essential for maintaining clear communication and is an integral piece of standard “Incident Command System” emergency response procedures. In past public health emergency situations, GIS wall maps of each of Vermont’s 12 health districts have been available to assist with coordinating situational awareness between the Health Operations Center (HOC) at the Vermont Department of Health Central Office and the local health district offices. In 2015, a new series of paper wall maps was developed to include improvements such as map collars for quick reference and standard map scales for use with measurement protractors. In 2016, a matching web map was created to provide the same map data content to a wider audience. The new VDH emergency response web map is highly interactive and includes a geocoding tool for quickly zooming to map collar coordinates (eg. E4) as well as to street addresses or lat/long coordinates. This NEARC conference session will provide recommendations and advice to other organizations that might be working to produce similar situational awareness paper map and web mapping resources. ABSTRACT: Learn what changes are coming to ArcGIS Server and Portal for ArcGIS in this major release at 10.5! This presentation will provide an overview of upcoming features for WebGIS, including a brief look at the new GeoAnalytics Server Extension and server-based distributed Raster Analytics. ABSTRACT: Midwestern states endured an outbreak of Highly Pathogenic Avian Flu in the Spring of 2015. Tens of millions of birds were euthanized and cascading effects rippled through the food supply. How might Massachusetts manage such an outbreak? Is human health a concern? Are domestic &/or wild bird populations at risk? Where are birds of concern located? How might we triage, test and depopulate flocks? How and where would we manage the carcasses of deceased birds? Is this a 24/7 emergency situation? Which agencies will be involved? How can we streamline processes and avoid duplication of effort when 10 State and Federal agencies are involved? What role might GIS professionals play in this situation? Can we share data and play nicely in the sandbox? Please join us for the answers to these and other questions … and a little bit of bird humor. ABSTRACT: This workshop is designed for data users who want to research local workforce and employment trends. The course content will include training on navigating the Local Employment Dynamics website and exploring LED tools including On the Map and QWI. These tools allow data users to analyze employment, hiring, job creation and destruction, earnings and much more for workers by industry through charts, maps, and interactive tables. ABSTRACT: Map books a great way to share a lot of information and compare one location to others. Unfortunately, Data Driven Pages has it's limits. Using Python and the arcpy library you can create your own custom map book tool that allows you to automatically run a custom analysis on each page of your map book based on the visible extent and create layout elements based on the results. Creating your python code with an eye toward reuse will give your publications a consistent, professional look and allow you easily create similar projects based on other map templates. ABSTACT: In this session, you'll learn how the ArcGIS Online Crowdsourcing web application templates can be used to engage citizens in your community. ABSTRACT: ArcGIS Server and ArcGIS Online platforms are both used by the Town of Easton to provide GIS services. As the demand for services has begun to outgrow the current capabilities of our IT infrastructure, many services have been shifted from ArcGIS Server to ArcGIS Online. By leveraging ArcGIS Online, we have been able to grow our services and also unburden some of the work load from our own servers.This presentation will take a closer look into the workflows and tools used to publish and maintain services hosted on the ArcGIS Online platform. Python scripting and the REST API resources used to automate workflows will be explored. ABSTRACT: The National Hydrography Requirements and Benefits Study (HRBS) was performed to establish a baseline understanding of national business uses, needs, and associated benefits for national hydrography data, and to inform the design of an enhanced future program that balances requirements, benefits, and costs. The study was sponsored by U.S. Geological Survey (USGS) and the U.S. Department of Agriculture's Natural Resources Conservation Service and was completed in May 2016. Study participants included 21 federal agencies, non-profits, private and commercial entities, and local, state, and tribal governments from across the 50 states, Washington, D.C., and American Samoa. An analysis of the results found that an improved national hydrography program has the potential to help users realize an estimated $602.5 million in annual program benefits if all reported requirements were met. This presentation will provide a review of the HRBS and USGS plans for using the results. ABSTRACT: ESRI ArcGIS is a powerful geo-spatial platform which includes desktop, server, web and cloud components. In general, operations with data within the platform are straight forward due to common data formats and standards. In many cases, users need to bring data from external sources/organizations and multiple formats such as CAD, BIM, Excel, Social Networks, XML, text-based formats into the ArcGIS environment. ArcGIS has a Data InterOperability extension, which allows users to build powerful ETL (extract-transform-load) and automation workflows. In this hands-on workshop, we will show practical examples of bringing data from/to CAD (utilities, architectural drawings), harvesting and processing CAD attributes, creating complex PDF reports and data maintenance automation workflows (bulk attribute renaming, remapping data schema, QAQC, merging multiple data sources, etc). The workshop targets users with some ArcGIS Desktop experience. Some experience with Model builder is useful. No programming experience is required. ABSTRACT: The ArcGIS for Flood Solution delivers maps and applications to support the mission of Emergency Management organizations which facilitate work in preparedness, response, recovery, and mitigation of flood events. Come learn how these maps and apps work to support this critical work. ABSTRACT: NYS Department of Environmental Conservation (NYSDEC) has a large amount of historical and legacy data that has yet to be digitized. This data exists in a variety of formats including the original paper data forms. I've quickest way to pull this historical spacial data into the ArcGIS environment is using MS Access and Python. MS Access is available and familiar to all employees where as ArcGIS has limited availability to staff and there are only a small number of people trained to use it. By using a combination of arcpy and open database connectivity (ODBC) python libraries staff are able to quickly enter data into a form and update the information in the ArcGIS geodatabase. This new workflow is helping to alleviate data entry backlogs and will hopefully allow the data to be used both in-house and shared with the public via open data portals. ABSTRACT: Esri’s location platform helps you utilize your organization’s geographic information to improve communication, heighten awareness, promote collaboration and enhance decision-making. During this presentation we will showcase ArcGIS solutions and show how they can be used to rapidly collect and share information, as well as streamline workflows between Federal, State, County and Municipal levels. Learn how Esri’s ArcGIS platform affords you an immediate, Consumer-Off-The-Shelf (COTS) approach to mosquito control and mitigation efforts. ABSTRACT: When we moved into a farm in Brimfield, MA we knew we wanted animals. We also knew we were moving to a piece of sloped land that went directly into a eutrophic pond. This piece of land has since become about as GIS'd as most Superfund sites. We have analyzed impacts from every proposed land use, and have used visualizations for specific projects to minimize any possible detrimental views.